Great Duck Island got its name in the 1700s from a pond in its center that attracted large flocks of ducks each spring. There was discussion of establishing a lighthouse on the island as early as 1823 to aid mariners heading for the Mount Desert area and Blue Hill Bay from the south, but many decades would pass before the idea became reality. Work on the station began in May 1890. A double boat slip and boathouse were constructed on the east side of the island, joined to the lighthouse site by a 2,251-foot-long road. A 20-by-30-foot barn was erected at the lighthouse site to serve as temporary quarters for the workmen. Construction was completed by the end of the year, and the light was established on December 31, 1890. The lantern on the 42-foot cylindrical brick lighthouse originally held a fifth-order Fresnel lens. A brick service room was attached to the base of the tower, which was painted red until it was changed to white in the spring of 1900. In 1902, the original lens was replaced by a fourth-order lens. Many other improvements to the station were made in the 1902-1906 period, including the addition of a tramway from the landing to the fog signal building. The light was automated in 1986 and the Fresnel lens was replaced by a modern optic. 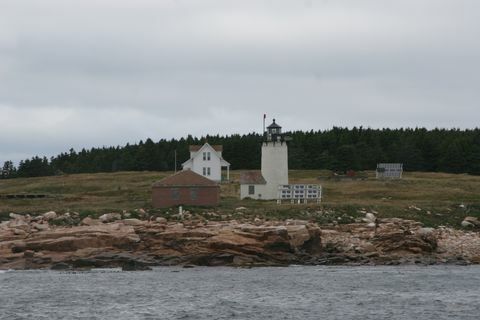 The light remains an active aid to navigation, while most of the rest of the island was purchased by the Maine Chapter of the Nature Conservancy in 1984. The Nature Conservancy estimates that Great Duck Island supports 20% of Maine's nesting seabirds. The lighthouse can only be seen by boat or airplane.